Located 300 metres from both the Accademia Gallery and Florences' Cathedral, Hotel Regina offers basic rooms and free Wi-Fi in the lobby. A continental breakfast is served daily. The Regina Hotel is just a 10-minute walk Santa Maria Novella Train Station. The friendly team of staff can assist in booking museum tickets, guided tours, and airport transfers. Charges for parking vary according to the size of the car. Garage parking is 1.5 km away. Guests can reach the hotel with their car and then leave the car keys at the reception. The valet service will pick up the car and park it in the garage on the day of arrival, and return it on the day of departure. Set on the corner of Piazza del Duomo, overlooking Florence cathedral and the Bell Tower, Albergo San Giovanni offers rooms with classic décor. Wi-Fi is free in public areas. 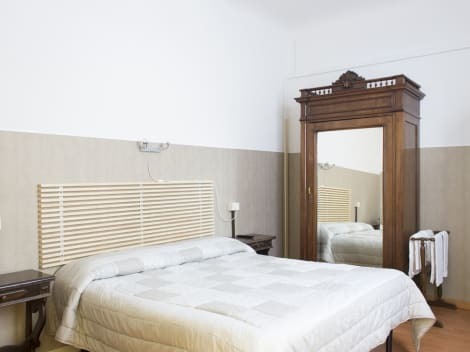 This traditional Florentine house offers spacious rooms, some with wooden floors. They feature either air conditioning or a fan, and a private or shared bathroom. Staff provide tourist information and luggage storage on the morning of your check-out day. With such a central location, San Giovanni Albergo is great for exploring Florence with the Duomo right outside and the Accademia Gallery only 10 minutes' walk away. Continental breakfasts are available daily from 8:30 AM to 10:00 AM for a fee.